I am considering this idea. For a 36V golf cart application, I want to be able to quickly charge it (but not to 100% State of Charge (SoC)). The idea is to give the 36V bank a strong boost in between 18 hole rounds while I eat lunch and rest for 1 hour total. My regular 36V 21A charger will not put enough Ahs back into the 36V bank in 1 hour to be able to make another 18 holes if the golf cart was already sluggish after the first 18 holes. So my idea is this: assuming FLA (Flooded Lead Acid) batteries can handle any reasonable amount of charge current while still in the bulk charge phase (normally from about 0% to about 70% SoC), what if instead of using chargers, I already had a bank of batteries at a higher voltage and used that to charge instead? That is, imagine a fully charged 38V bank of batteries of similar capacity as the 36V golf cart FLA batteries and I just use "car" jumper cables to connect them. That is about 5.6% overvoltage on the charging side which is very reasonable to start. That would be like hitting a 12V battery (with an OCV of 12.8V) with 13.5 volts which seems about right. 38V could be had by using 12+12+8+6 volt batteries in series (I have all of those). I could maybe leave this configuration connected for 20 minutes (of the 60 minute cycle). The 2nd phase would be to get the charging voltage up to 40V by using 12+12+8+8 volt batteries in series. I would hold that for another 20 minutes. The 3rd and final stage would be 42V which would be 12+12+6+6+6V. The 12V batteries that will be used in all 3 stages are large AGMs so they should be ok if fully topped off beforehand. 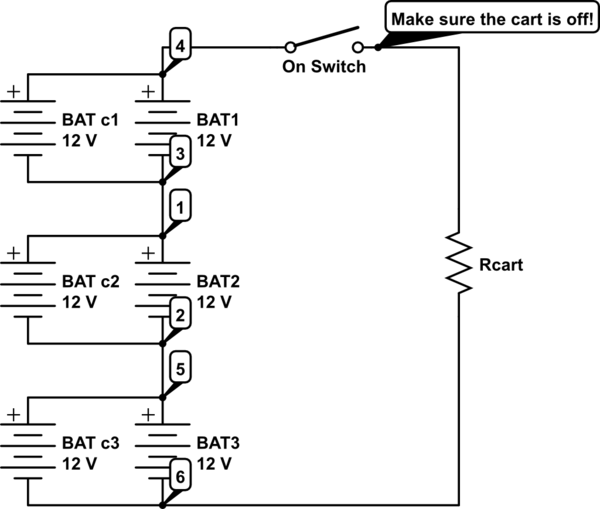 I agree this could be somewhat risky because I do not currently have a way to control or even monitor the charger amperage but the 3 stage ramp up from 38V to 42V seems reasonable. Also an advantage to doing this is before I am ready to start the 2nd 18 holes of golf, I can simply put all the batteries used to charge on slow charge as there is no rush to charge those. Another advantage is I already have all this equipment so I wouldn't have to buy any high amperage chargers. So the main question is will this technique of using progressively higher voltage battery banks to charge a lower voltage battery bank work? It seems like it should because if a regular 36V "golf cart" charger starts out around 38V, that is what I am simulating using my 38V battery bank. Since this is a timed charge event (1 hour max), there is little to no risk of overcharging. The batteries getting charged will likely not even be gassed correctly but this is just an "opportunity" charge, not a full charge. After the 2nd set of 18 holes (if it makes it), I can simply put the 36V golf cart on the regular 36V 21A automatic charger overnight so it will get a good proper 100% charge. This seems like the "best of both worlds". I have an opportunity to test my idea as early as today so anyone with comments and/or answers please post them promptly. Thanks. To be more clear, I will list the exact batteries I will be using on the "donor" side and the exact batteries I will be using on the receiving (being charged) side. Also one thing I should clear up is my 36V golf cart is actually 38V cuz I swapped in a single 8V FLA battery in place of a removed 6V FLA battery. It is just experimental but seems to be working ok. I know by doing that the batteries will not get a full charge which is why many time I instead use 3 different chargers and charge battery pairs. So in the above description, the 3 phases would actually be 40V, 42V, and 44V, not 38V, 40V, and 42V. That actually decreases the overvoltage percentages slightly which may be a good thing. (quantity 2) 10+ year old 12V AGM 126Ah rated but more like half of that actual Ah capacity + (quantity 2) 8V FLA golf cart batteries (rated at 160Ah but way below that actual). So 12+12+8+8 = 40 volts on the donor side. Receiving side (golf cart). (quantity 4) Powertron P2000 200Ah rated FLA batteries likely only having 120-150 actual Ah each (medium health and age). (quantity 1) "standout" 6V 200Ah FLA battery in very good health (like new). (quantity 1) 8V 150Ah rated FLA battery in medium health and age. Depending on what jumpers I use for both battery banks, there might be enough (or even too much) resistance to get 50A to flow initially. The flow rate of this over the first 20 minutes would be so interesting to plot on a graph that I may actually attempt it. Also worth mentioning is since the 8V "donor" batteries are used in stages 1 and 3 only, I could give them a quick recharge in stage 2 to help them deal with stage 3 or maybe even better, I can leave my lab PSU attached to them even when they are being drained by the receiving bank. Since I can set the lab PSU to be limited to 3A (the max rating of the lab PSU), even under heavy load, the lab PSU will only output 3A. During stage 2 the lab PSU will still be putting out 3A into the 24V subbank (12+6+6V batteries). That will help a little bit for them to "recover" quicker. I could also parallel connect the 8V batteries in stage 3 cuz they will be "tired" from stage 1 and since I only need one 8V subbank in stage 3. Obviously there will be some "fancy" rewiring going on between stages but a simple chart will help ensure no mistakes. It is well within my capability to do this. 7 batteries total are needed to get the required 3 donor voltage combinations of 40,42, and 44V. I also have a plan drawn out as to which subbank the lab PSU will be parallel attached to on the donor bank for each stage. It will help those batteries that have to continue in a future stage and in stage 3, will help those batteries that have already been used in a previous stage. This is very dangerous: Do not attempt it in your current configuration. so you would need 3 26 Ah batteries to hook up in parallel to get from 10 to 70 in the safest possible way. Here is a diagram to show you the safest way to hook up the batteries so that you do not accidentally damage anything. the 'c1' -'c3' are your charging batteries, and the numbers in bubbles indicate in which order to hook up the batteries. Please don't try to change the order, you may cause damage to the electronics, and more importantly, yourself. My simple answer to this question would be just to try it but very carefully using the minimal voltage difference first using a real clamp style ammeter and just "blip" it for a few seconds from a safe distance. If it shows 50A or less initially, then that is reasonably safe since it will likely just drop from there. It would be interesting to record both the starting and ending amperage for each 20 minute charge segment. For example, it might go from 50A to 20A and then back up to 50A for the start of the 2nd segment. It would also be interesting to compute the average charge rate by taking readings every minute. If it is say 35A average, that is way quicker than my 21A charger which would probably average 20ish the first hour. It would be close to double the charge rate which is exactly what I want and not having to purchase any new chargers is a big + (pun intended on the + which is the normal marking for the positive). Not the answer you're looking for? Browse other questions tagged batteries battery-charging safety lead-acid or ask your own question.